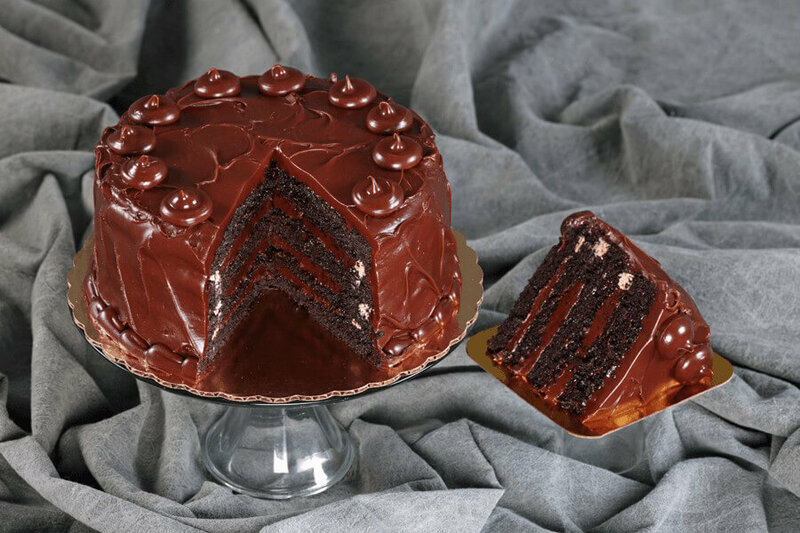 (8″ serves app 12) Four layers of dark UltramoistTM chocolate cake drenched with 3 layers of dark chocolate fudge frosting in-between, on the sides, and on top. (8" serves app 12) This is Omaha's "original prize-winning recipe" that will thrill your taste buds. Over the last 30 years everyone has tried to imitate us. But, we are the home of the real deal. Four layers of slightly tart pink UltramoistTM cake filled with our homemade champagne filling (no alcohol); frosted in vanilla whip and finished in pink chocolate sprinkles. (6" round serves 4-6) Two layers of UltramoistTM marble cake sandwiched and frosted with vanilla buttercream frosting. Finished off with bright colored frosting candles. (8" serves 8-12) Two layers of UltramoistTM vanilla cake, sandwiched and frosted in vanilla butter cream. Finished off with seasonal flowers.